Personalize the front cover with your name or business name. Please be sure to check all spelling, I copy and paste what you type. Do not use all caps. If you don't wish to have it personalized, put "none" in this area. The 'Dot' logo will be used instead. Hello and thank you for viewing my product! Please read all the specifics about EACH edition below before ordering. I have several different editions of this book so be sure to find the one that's right for you. Note: For the editions that include a 7-day appointment book – they are NOT pre-dated (and unfortunately I cannot pre-date them for you). I added the days of the week at the top of the pages, but you will have to fill in the month and day. Also, the weeks start on MONDAY. If you need them to start on SUNDAY please let me know before ordering. 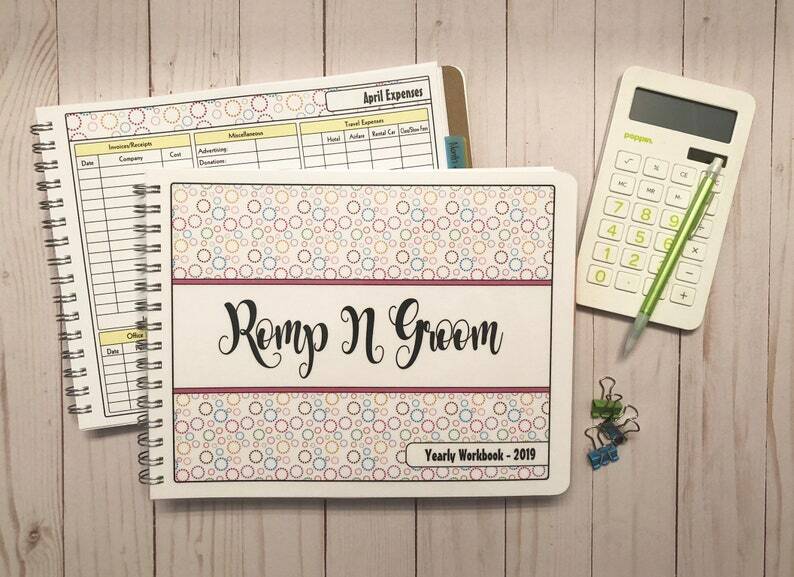 •	Yearly Appointment Book (7 Days/Week Format) with places at side and bottom to keep track of daily and weekly income - NOTE: The daily time starts at 8:00 a.m. and ends at 7:45 p.m. and has increments on the 1/4 hour. If you need a different time frame please contact me before ordering. •	Yearly Appointment Book (5 Days/Week Format) with area to keep track of daily income. •	**Note: This version does NOT include a standard appointment book section. However, there is a section to keep track of daily appointments and income. •	Yearly Appointment Book (5 Days/Week Format) with area to keep track of daily income. NOTE: The daily time starts at 8:00 a.m. and ends at 7:45 p.m. and has increments on the 1/4 hour. (8:00, 8:15, 8:30, 8:45, 9:00...etc). If you need a different time frame please contact me before ordering. •	**Note: This version does NOT include a standard appointment book section. However, there is a section to keep track of appointments and income. •	Front cover is laminated. •	Back cover is chipboard (thick cardboard) and cannot be laminated. •	This book can be customized with your name or company name on the front cover. Leave specific directions in the Notes to Seller section at checkout. •	Size is 11" x 8 1/2". •	This item ships to you completely printed and assembled with divider pages. Item is NOT available as a direct download. •	RETURN POLICY: Since all items are made to order I do not offer refunds. •	Notice: These books are my own unique design and ideas and are Copyright Protected. Copying the format and designs will be reported. Great item and was shipped so fast even with it being customized. I love it. Thank you. Will definitely order again.